I’d like to say that we have a rockin’ fall garden. But we don’t. Every year, it’s a goal to replant in late July/early August so that we can enjoy a second harvest, but summer fun gets in the way. That made this week’s discovery of one lone zucchini ripened on our vine a cause for celebration. And what better way to share it than in zucchini bread? This recipe’s healthy enough to actually be called “bread.” It’s still yummy enough to be a treat, but you could substitute chocolate chips for raisins to make it a dessert. Combine dry ingredients in a bowl. Add wet ingredients and mix. Bake in a loaf pan at 350 degrees for 50-60 minutes. The real question is how you managed to harvest just one zucchini. We had a family garden when I was a kid, and the zucchini supply would far outstrip demand. 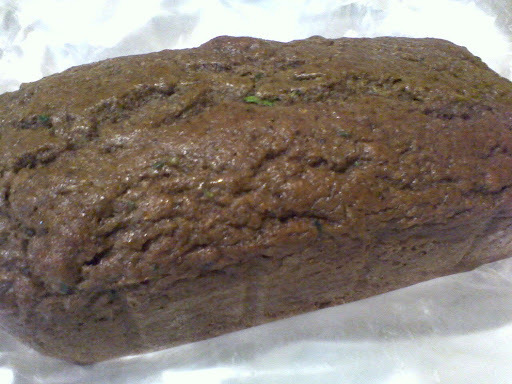 My dad used to say that the problem with zucchini bread is that it doesn’t use enough zucchini. it was the end of the season–already so cold, so it was a great surprise. As for extra zucchini? share it!